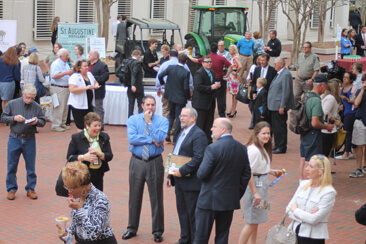 As part of their celebration of National Agriculture Day, Florida Farm Bureau members will hold a Taste of Agriculture reception on March 8 during their Legislative Days at the state capital. The annual Farm Bureau citizens’ lobbying event allows grassroots members to visit with state legislators on Farm Bureau priority issues. The Taste of Agriculture Reception will feature special guest speakers Commissioner of Agriculture Adam Putnam and Florida Farm Bureau President John Hoblick. “By inviting legislators and the public to sample locally grown food and meet farm families, we thought the reception was an ideal venue to help promote this year’s National Ag Day theme, Agriculture: Food for Life,” said FFB State Legislative Affairs Director Adam Basford. National Ag Day will be held March 21 during National Ag Week March 20-24, and is organized by the Agriculture Council of America. Ag Day events and celebrations take place in communities across the country to help remind citizens that agriculture supports of all of us. To register for the Florida Farm Bureau Legislative Days, held March 7-8, visit https://www.floridafarmbureau.org/events/florida-farm-bureau-legislative-days/. Florida Farm Bureau, the state’s largest general agricultural organization, represents more than145,000 member-families. We serve to enhance farm enterprise and improve rural communities.